There is nothing more important than the power of play in early childhood learning. Play is the way that young children learn about the world, be that through social interactions, developing fine motor skills, learning language skills or developing their powers of imagination. The world of play also encompasses singing silly songs to experiment with language, playing physical games and exploring the world through re-enacting various role-playing scenarios. Whatever children do, they learn best through play but in recent years a new way to play has come on the scene. There has been a huge increase in the rise of iPad, iPhone and Android apps which are both intuitive and educational and have captivated a whole generation of preschoolers. For parents who are worried about the amount of “screen time” their youngsters are exposed to the rise of such apps may have some cause for concern. After all, many experts suggest that children under the age of two should be allowed to watch no television at all, with older children being limited on the amount of television they watch. With educational apps, however it is a slightly different story as far as the experts are concerned. Unlike television watching which is a passive, one way process in which children tend to “zone out” from the reality around them, educational apps encourage an interactive, two way approach to learning. When using educational apps, young children are not only being exposed to the world around them, they are developing their fine motor skills and cognitive abilities in a challenging and stimulating, interactive environment. Just as with any other kind of toy or entertainment, parents should exercise some control over what they allow their children to play with. There is a vast choice of so-called educational apps on the market so where do you start with choosing the best ones for your child? Ex. 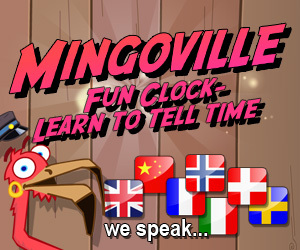 do your kid need to learn to tell time, The Mingoville Fun Clock App could be a good app to choose. Or if the kid need to practice math the Apps from Mondiso can be recommended. There is no way to block inappropriate content from your device so ensure that you only download apps from a trusted developer. User reviews are also a great way to find out whether an app is suitable for your child so make sure you read them before you make your choices. It is also wise to try out the game yourself before handing it over to your child. You want to go for apps which are challenging and entertaining and avoid those which are repetitive, boring and fail to stimulate your child`s imagination. As with all technology it is a good idea to limit the amount of time your child spends playing with these apps. Despite that, your mobile phone can be used for so much more than merely distracting your child while you are at the supermarket. Choosing educational and entertaining apps can certainly help your child get a head start when it comes to learning about the world through play. This entry was posted in Mondiso, News by admin. Bookmark the permalink. Nice read. I’m an educational games developer.